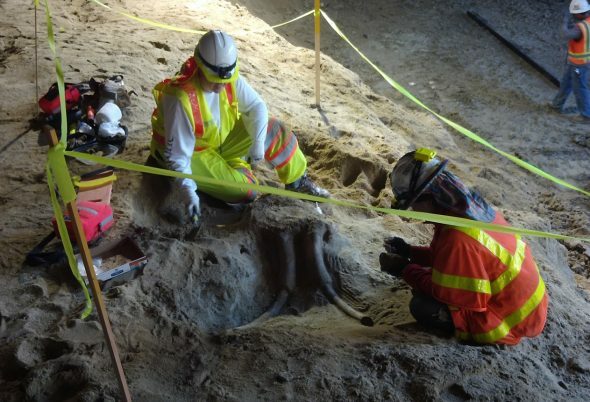 ICYMI: fossils of ancient elephants were found in the Wilshire/La Brea Station excavation site recently. Parts of one fossil have been identified as belonging to an adult mastodon, while the other could be the partial skull of a young mastodon or mammoth — we won’t know for sure until the skull is cleaned off and examined. Project paleontologist Kim Scott is leaning toward young mastodon since the skull fossil was found at the same depth below street level and just a few feet away from the adult mastodon fossil. Mastodons are just cooler, okay? No one ever tried to fight evil with a Mammoth Dinozord. Check out the video above to hear some fun facts about the find from Kim Scott. You’ll also get to see a replica set of mastodon teeth and a borrowed REAL mammoth tooth. I was really excited to get to handle the tooth — normally you go to a museum and you’re not allowed to touch anything, but I can now say I got to touch a 10,000-plus-year-old mammoth fossil. It’s the small pleasures in life that make it worth living, wouldn’t you agree? It was also interesting to learn that if Metro hadn’t been digging a subway under Wilshire Boulevard, these fossils might never have been found. Despite being just 15 feet underground, the fossils were beneath layers of utilities in the middle of the street. Since the utilities were put in place at about 10 feet underground, it wasn’t likely any more utility work would have ever led to the fossils’ discovery. Then Metro came along and began digging a subway station, and hello, ancient elephant relatives. Finally, it’s worth noting that the reason we’re so excited about this find is because no one was really expecting to find anything at this location. The soil conditions at Wilshire/La Brea are sandy and erosive and that’s the kind of environment that destroys most fossils over time. But here we are — and here’s hoping we find more as we continue digging the line. The fossils have already been preserved and moved offsite for further analysis, which means construction of the Purple Line Extension is back on track. There won’t be any change to the alignment and a reminder: decking work at Wilshire/Fairfax will start in early 2017. Because the fossils were found in sandy soil, they won’t go to the La Brea Tar Pits. (the La Brea Tar Pits gets fossils which are found in asphaltic matrix — you know, that black tarry stuff.) Instead, they’ll be handed over to the Natural History Museum, and hopefully you’ll one day be able to visit them there via the Expo Line. I can’t believe the stupidity of this story. It seems to imply fossils should only be found near the La Brea Tap Pits and no where else. It brings to mind a hazard I observed while a MTA Supervisor when I observed a thick oily substance seeping up into the street, Wilshire Bl., across the street from the tar pits. I was sure of the source but was questioned by some at the MTA what was my basis for believing it was part of the pits across the street because it was beyond the fenced area. Am I surprised by the find, not at all? Do I expect to read of further finds, yes and hopefully a find/finds that are record breaking? Lastly I expect the tunneling to run into not only further finds but it may face some extremely difficult challenges passing the La Brea Tar Pits perhaps so difficult the route will have to be changed adding millions to the project and deeming the partially built Wilshire / Fairfax Station useless.